For many people, especially those of us here at Android Police, Google's various backup tools are an integral part of our daily workflow. Frankly, I'd have to entirely restructure how I do things without the convenience of Google Photos and Google Drive/Backup and Sync. For some, the combination of those two services isn't working as expected when it comes to Motion Photos, and backup synchronization to a desktop fails for those MVIMG-labeled images. This isn't the first time Motion Photos have introduced problems with Google Drive. 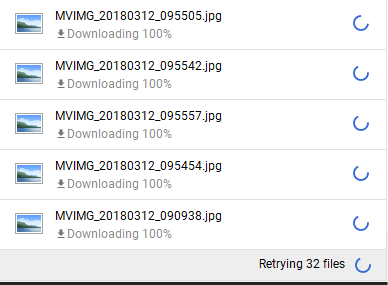 Last year, shortly after the introduction of the new Motion Photos, MVIMGs files deleted via Google Photos weren't actually being deleted (much to our own Artem's chagrin). This new problem, in which Motion Photo images refuse to download via the Backup and Sync client, has been reported since around the beginning of the year, and not everyone seems to be affected. Again, Artem is experiencing the problem on his account, but mine is synchronizing Motion Images/MVIMG-labeled photos just fine. So far reports on the Product Forum are mostly for Windows clients, but some of our readers on OSX are also affected. You should be able to confirm the problem by glancing at the status of Backup & Sync on your desktop (right-clicking the icon in the taskbar on Windows, clicking the app icon in the menu bar on OSX, or righteously raging at Google for the continued lack of a client on Linux) and checking for "can't sync" errors. If any are present and the files associated with the problem begin with "MVIMG," then you are likely affected. Google has responded to the forum inquiries, stating that it's aware of the bug affecting Motion Photos and that it is working on a fix. We're aware of a bug affecting the backup of Motion Photos and are working on a fix! We apologize for the inconvenience. I'll follow up with an update once we're able to fix the situation.